Prof. dr hab. dr h.c. Jörg Hartung is veterinarian and Professor for Animal Hygiene and Husbandry and Professor for Animal Welfare Science of the University of Veterinary Medicine Hannover (TiHo), Germany. 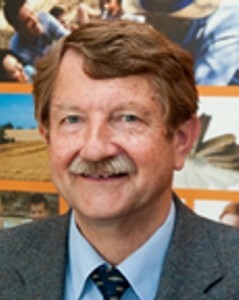 He is Honorary Doctor of the Swedish University of Agricultural Sciences (SLU). For 20 years he served as director of the Institute for Animal Hygiene, Animal Welfare and Farm Animal Behaviour of TiHo. Between 1991 and 1993 he lead the “Environment Group" in "Welfare Science Division" in Silsoe Research Institute, UK working at the cutting edge of veterinary medicine/biology and agricultural engineering. Prof. Hartung has more than 40 years experience in teaching and research. His core expertise covers a broad spectrum of topics. (1) Animal health and prevention of transmission of disease agents, air quality research on gases like ammonia, odours, dust and bio-aerosols and airborne bacteria, ventilation, bio-security. Standard setting for measurement of airborne bacteria and odours. (2) Animal welfare of food delivering animals along the food chain from housing, transport, stunning methods and humane slaughter. Investigations of transport stress by road and sea transport. Behaviour and animal based measures as indicators of animal welfare. (3) Protection of the environment by reducing gaseous, viable and non-viable emissions from animal production by abatement techniques. (4) Occupational health aspects in animal farming, setting rules for protecting the respiratory health of the workforce. He participated in numerous EU, international and national research projects and reviewed research applications for EU, national and international research programmes. His experience has been requested by numerous national and international organisations, committees and advisory boards. He consulted as expert in legal cases in front of courts in USA and Germany and carried out consultancy in different fields of the production of food delivering animals. He served 9 years as expert, of which 6 years as vice-president, of the Scientific Panel for Animal Health and Welfare (PAHAW) in the European Food Safety Authority (EFSA). He chaired for many years the working group “Effects of Air Pollutants on Farm Animals and Food”, German Engineers Association (VDI) and DIN (German Industry Norm). Further, he was member of the advisory board “agricultural policy” of the Ministry for Agriculture, member of the working group on “Biological Risks at Workplace Agriculture” of the ABAS in Germany and co-founded the European Forum of Animal Welfare Councils (EuroFawc). Currently he is acting President of the International Society for Animal Hygiene (ISAH) and chairman of the Federal Committee for Animal Welfare (BMEL), Berlin, Germany. He is also member of scientific advisory board of the program „Animal health in development cooperation, Africa” of the Fed. Ministry for Economic Cooperation and Development. Further activities include membership in the Board of Trustees of Tönnies Research Foundation, Rheda, chair of the advisory board of FQ-CERT, Hannover - certification in food industry, Germany and partnership in AQRaD GmbH (Animal Quality Research and Development), Hannover, Germany. From 2014 to 2017 he spent every year several months as guest-professor at the University Sao Paulo, Brazil, Faculty of Veterinary Medicine. Numerous PhD theses were successfully prepared under his supervision. He published more than 225 refereed journal publications, about 60 co-authored EFSA reports and opinions, about 250 congress and miscellaneous papers. He is member of the editorial board of the International Journal of Animal Bioscience (“Animal”) and holds several patents in the field of animal hygiene and animal welfare.